Insiders within Ho Chi Minh City’s education and training industry said that most of this year’s standard marks required by state-owned high schools have increased strongly, causing students and parents a great deal of anxiety. 21,000 students among 48,000 candidates who participated in the 10th grade entrance exam in the school year 2010-2011 received a total mark of 30 or above. Precisely, 10,009 students scored between 30-35 marks; 5,035 students at 35-37.5 marks; 4,551 students at 37.5 –40 marks; and 1,778 students achieved scores of more than 40 marks. The examination also saw 474 students who got zero marks. The number of students with a total mark under 15 was larger than last year. These students will lose their chance to enter the 10th Grade because the minimum mark required by many high schools exceeds 15.75, said experts. “The total mark in the 10th grade entrance exam for the 2010-2011 academic year will not be higher than last year because there have been low marks in mathematics” teacher Tran Mau Minh, headmaster of Tran Van On Junior High School, added. 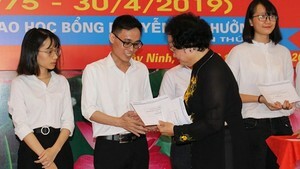 Experts of HCMC Department of Education and Training said that the standard mark fluctuates among high schools, many of which require a total mark under 35, attracting many students. However, the floor mark of every school also depends on the number of students registered.